In the fantasy world of MapleStory, prepare yourself for an exciting adventure while you tour and explore cool maps and places around the world! The world of MapleStory is vast beyond imagination and new areas are still being discovered! There is always something to do or somebody to talk to be it on the snowy mountains of El Nath or in the scorching deserts around Ariant. Go forth and battle monsters, complete quests to level up and grow strong! But all work and no play makes a Mapler dull, so don’t forget to make friends and have fun while you are here. Everyone has a beginning, and different people starts from different places and meet different people. Victoria Island is a place all new and enthusiastic can train to become stronger for the challenges ahead. For Adventurers, you can venture into the different towns and choose your class and destiny. The monsters around the towns areas are ideal for those who have not done their 2nd Job Advancement, but beware, monsters get stronger as you stray further away from towns. The two ways to reach Ossyria is by ship from Erev or from Victoria. To travel to Ossyria from Victoria Island, one must visit Ellinia in Victoria Island to take the ship to Orbis. During the trip to Orbis, monsters will appear and attack and if you are not strong enough, so you may have to hide in the cabin. The monsters on this continent is generally stronger than those on Victoria Island, so make sure to equip yourself with your best equipment before leaving town. 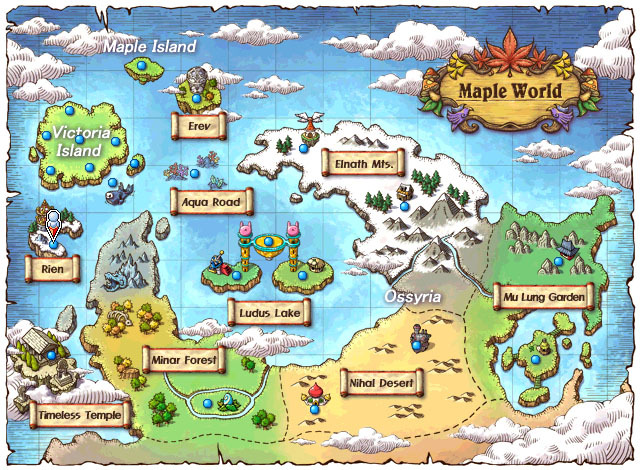 There are more areas in the Maple World than two continents can contain, some of them on islands of their own or even in the past. Visit these completely different areas, whether for challenging one of the most powerful monsters ever existed in MapleStory, find out more about Victoria Island’s past, or to get married with the one you love. There’s nothing quite like soaking up a new culture, learning something new by the minute! Look for Spinel and sign up for a World Tour package, and she will serve you as a traveling guide at a fee.